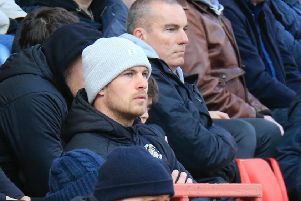 Luton boss Nathan Jones was left bitterly disappointed as two key decisions went against his side during their 3-2 defeat at Barnsley this afternoon. With the Hatters trailing 1-0 to Brad Potts' early goal, they were then denied what appeared a perfectly good equaliser when James Collins was adjudged offside from Pelly-Ruddock Mpanzu's shot that was fumbled by home keeper Jack Walton. Then when 3-2 behind in stoppage time, sub Danny Hylton was hauled down by defender Jack Lindsay, as Jones said of the disallowed goal: "It was a critical time and then 1-1 means they don't go down the other end and score two minutes later to make it 2-0, so it's a big, big decision. "I can't say that we would have gone on and won the game, because Barnsley edged the game today, they were better than us today, but when you're the away side you just need the correct decision to be given and then it could have been a different outcome. "We've had it, we didn't play well at Peterborough and then a massive decision, a wrong decision go against us, which could have changed things, so all these are points that means we climb the table. "I'm disappointed and I spoke to the referee, I'm going to see the referee as he said 'never a pen', but it's a clear penalty, Linsday has his arms around Danny's neck, granted it's only one arm, but he pulls him over with that around his neck, if it was in a nightclub, it's hand on his neck. "I can't criticise them too much, I'll go in and say, 'two big decisions went against us that were real big ones and I'm very, very disappointed. "Straight after they scored, Harry Cornick was played in and he's given offside for that and he wasn't, that wasn't a big decision, but it's a decision we could have got a chance from. "So they've made decisions that have gone against us, but I'll have to dissect the performance as well as we weren't at or levels today and that's a credit to Barnsley." Despite his annoyance at the officials, Jones did concede his side were second best on the day, adding: "I thought they were better then us today. "I thought they had more aggression than us, especially first half. They won the first ball and got on to the second, and that caused us problems. "They played with a bit more intensity which isn’t the case normally, full credit to them. We were way off our levels in terms of our ball retention, in terms of playing with intensity and fluidity, we were nowhere near. "I could chastise my players for that and say that we were bad or I could say Barnsley must have done something to curtail us. "They are a good side, we knew that. but we knew we needed to be brave, we needed to win our battles and we didn’t do that first half. "The goals from their point of view, they’ll be pleased. But once again, we lost a header and then they've run straight through the middle and shot and it’s pretty much identical to Doncaster, so we’re not learning. "The goals are really, really disappointing, but overall I thought Barnsley probably deserved their win, I cant stand here and say we should have got this. "In reality we should have, because there’s an onside goal and then we should have a penalty late on for a pull back, he’s got his arm around his neck and he's pulled over Hylton. "The big decisions have gone against us, but they were a little bit better than us today."